Windows 10 S is Microsoft’s new stripped-down version of Windows 10 Windows 10 S: Everything You Need to Know Windows 10 S: Everything You Need to Know Windows 10 S is a new stripped-down version of Windows 10 designed for schools. Let's discuss the good and the bad, and decide if you should buy one of the new machines. Read More . It’s nearly identical, with the major exception that you can only run apps from the Windows Store. Traditional desktop software, like Google Chrome or Paint.NET, won’t work at all. This slimmed-down operating system is aimed at the education sphere. Yet Microsoft is selling some high-end machines, like the Surface Laptop, with 10 S installed. If you’re curious as to how it will work, or want to see if you could live on a Windows 10 S machine, you can try it out free. Microsoft has made a Windows 10 S installer available, but you need a copy of Windows 10 Professional or higher to utilize it. 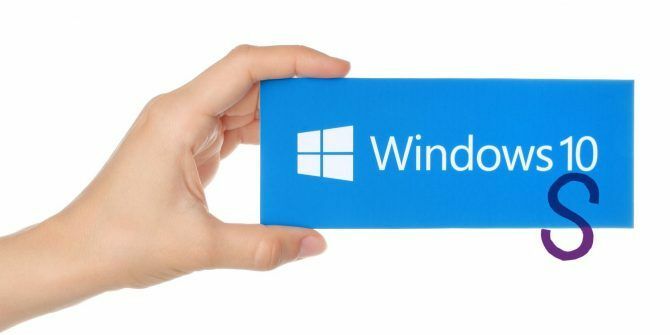 Thankfully, you can install Windows 10 without entering a product key — perfect for a demo of Windows 10 S.
Note that this process will convert an existing installation of Windows 10 Pro to Windows 10 S and deletes some personal files in the process. If you don’t use the rollback option to revert to your original installation within 10 days, you’ll have to reinstall Windows 10 the long way. We recommend trying this in a virtual machine. DO NOT install it on your main PC! First, set up a virtual machine for use with Windows 10 How to Install Windows 10 for Free on any Windows, Linux, or OS X PC How to Install Windows 10 for Free on any Windows, Linux, or OS X PC You don't have to upgrade to Windows 10 to try it. Whether you qualify for the free upgrade or want to try Windows 10 on Linux or OS X, you can evaluate it for free. Read More . You’ll need to download the Windows 10 media creation tool to create an ISO file that installs Windows 10 inside the virtual machine. Once the virtual copy of Windows is all set up, head to the Windows 10 S test page and click the Download installer button — make sure you do this in the virtual machine and not on your actual PC! Give the installer some time to download Windows 10 S, then it will restart and you’ll be able to see what it can and can’t do. If you try it for a few days and hate it, you can revert back to Windows 10 Pro 3 Ways to Downgrade Windows 10 & Rollback to Windows 7 or 8.1 Indefinitely 3 Ways to Downgrade Windows 10 & Rollback to Windows 7 or 8.1 Indefinitely You've either upgraded to Windows 10 to secure a free copy or were upgraded forcefully. We share three tricks that will help you downgrade now or later and save you if your upgrade failed. Read More . But since you’re using a virtual machine, you’re better off just deleting it. Did you give Windows 10 S a try? What do you think of this new version? Tell us your thoughts below! I wouldn't touch that SPYWARE/SPAMWAR with a 1000 foot pole and a pressurized space suit to protect me from the stink of its GREED!!!!!!!!!! I wouldn't touch that SPYWARE/SPAMWARE with a 1000 foot pole and pressurized space suit protecting me from its stink of GREED!